Finally! A fifties teen romance actually written in the 1950s! 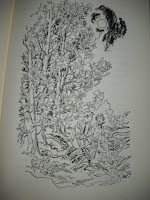 And possibly one of the most charming teenage novels ever written. 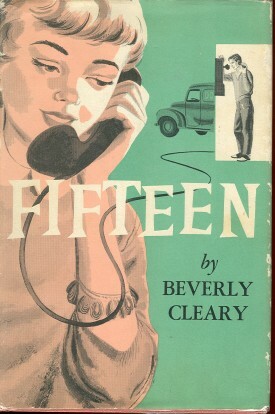 Beverly Cleary is mostly known for her children's books starring such memorable characters as Ramona, Henry Huggins, and Ralph S. Mouse, but she also wrote several heartfelt and funny teenage romance novels, the first of which is this one. As the dust jacket copy on my copy reads, "It is hard to think of any other American writer who has so successfully put on paper the sorrows and joys and absurdities of girlhood." "Today I'm going to meet a boy, Jane Purdy told herself, as she walked up Blossom Street toward her baby-sitting job. Today I'm going to meet a boy. If she thought it often enough as if she really believed it, maybe she actually would meet a boy even though she was headed for Sandra Norton's house and the worst baby-sitting job in Woodmont." And believe it or not--she does! And not just any boy, but Stan Crandall, who is "at least sixteen, because he had a driver's license. He had a nice smile and merry eyes--greenish-gray eyes. He had brown hair with a dip in it. He was not really tall, but he was tall enough so a medium-sized girl could wear heels and not feel she had to scrooch down when she walked beside him." And he's a nice boy, which is apparently what girls were looking for in the 1950s. I think I still have a little crush on Stan Crandall and his tan arms and silver identification bracelet. Dreamy! So we go through Jane's trials and tribulations when dating a boy seriously for the first time. How to behave on her first real date, what to order at Nibley's ice cream shop, how to stop her parents from alternately teasing her and worrying about her, how to get through dinner at a real Chinese restaurant in the city, and what happens when he doesn't invite her to the big dance. 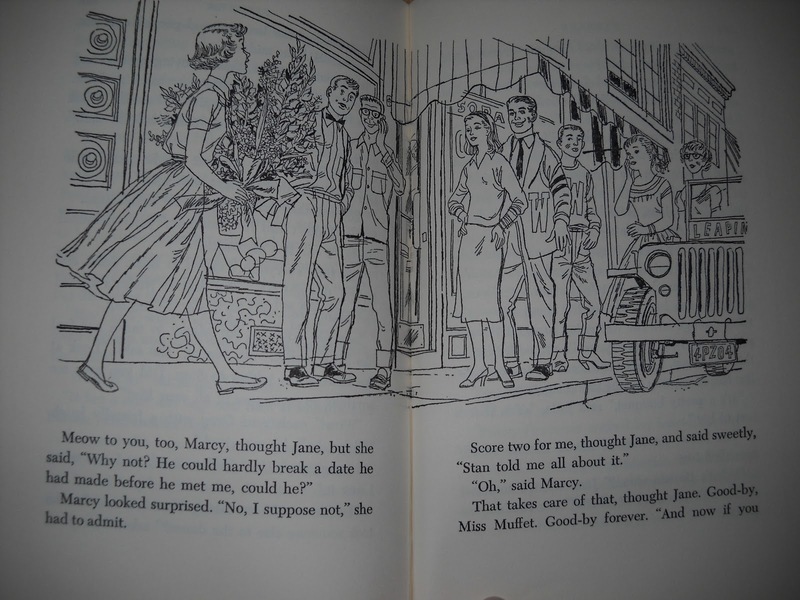 "Since she had made up her mind to be herself and since she was the kind of person who always did the wrong thing, Jane decided she might as wll make the best of it and start out by delivering the flowers to Stan." The book also has a marvelous sense of place. It's set in a suburb of a West Coast city (probably San Francisco), which has all the advantages of a small town (in the 50s, that is), which means walking to the movies and ice cream shop from home. Everyone has lovely golden tans, and gracious old redwood homes abound, as well as the "nodownpaymenttoveterans" houses owned by Jane's babysitting clients. 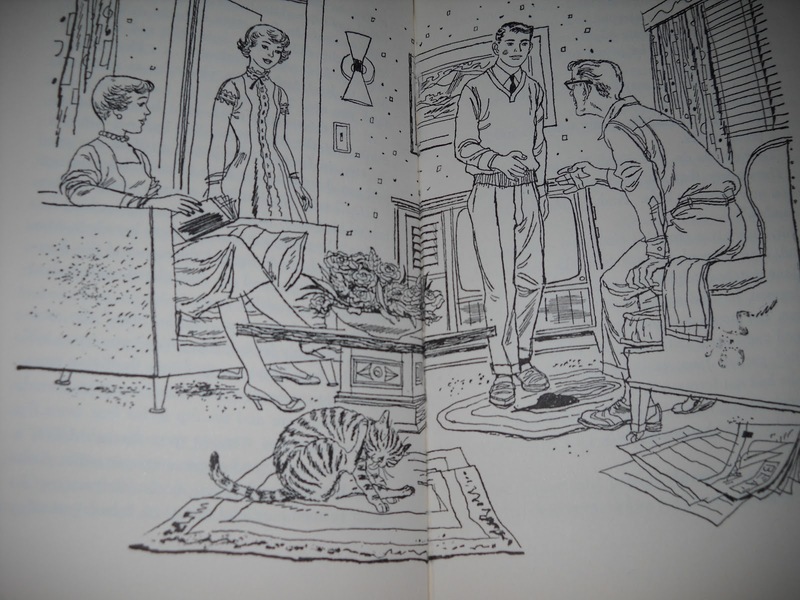 The line drawings, by Joe and Beth Krush, beautifully capture the time period, from Jane's clothes to the decor at her house when Stan comes to pick her up. 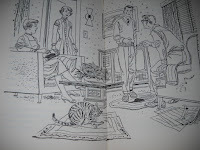 It's also an evocative look at (sheltered, middle class) teenage life in the 1950s. Before their first date, Jane starts to worry about Stan: "What if he came in a T shirt and jeans? Or one of those gaudy sport shirts with the tail hanging out? . . . Or maybe he would chew gum and snap it and guffaw at the love scenes in the movie." As for dinner in the city? Jane wears a suit and white gloves, but makes the major decision to go hatless. 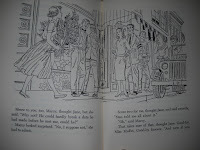 At the end of the book, Stan gives Jane his identification bracelet, which means they're going steady. 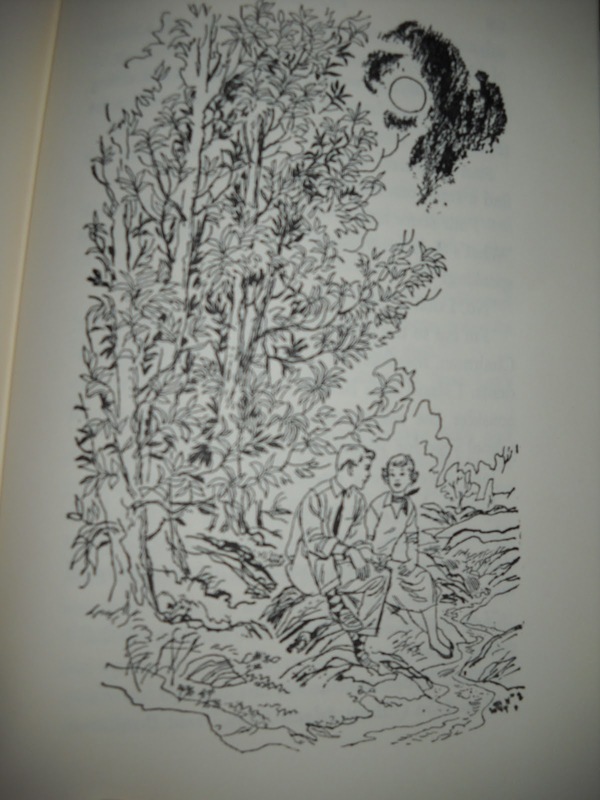 "Jane's wrist felt small and feminine in the circle of heavy silver links. Tenderly she caressed the letters of Stan's name with her finger tips. Stanley Crandall. The nicest boy in the whole world." Sigh! Even though the trappings are charmingly dated, certain truths about young love always ring true. Beverly Cleary had an amazing gift of insight into the minds of children with her books for audiences, and her teenage novels are no different. I only wish she'd written more than four. They are still in print and hopefully, they still speak to a contemporary audience. Despite the incidences of angst and drama, these novels are still like riding in a powder-blue convertible on a sunny day with a nice boy who has a dip in his hair, and golden-brown hairs on his tanned arms.